Yesterday I showed you the Mr Bump and Little Miss Naughty jumpers that I designed for issue 79 of Knit Now magazine. 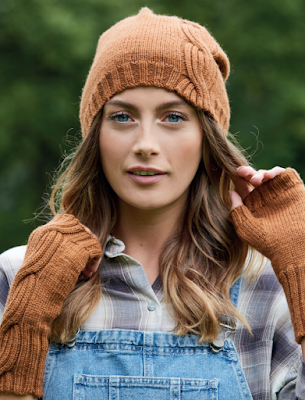 Today I'm sharing the other pattern set I have in the issue: my Scheurich hat and mitts set. The set is directly inspired by the onion motif used in Scheurich Keramik pottery. As soon as I saw the pottery, which features highly textured smoothly curved lines that look a little like the layers in an onion, I knew I had to replicate the curves in knitting. 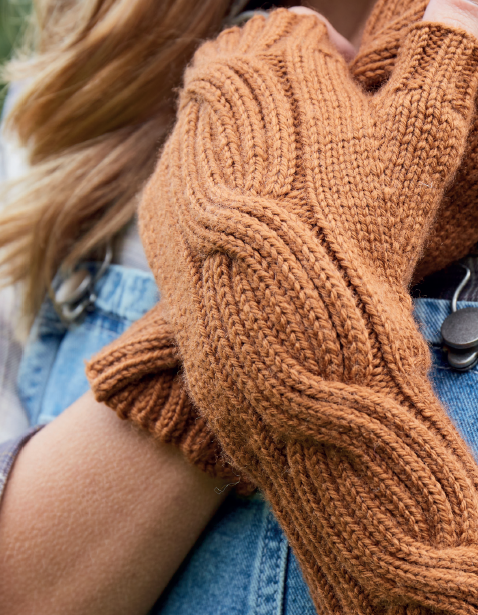 The hat and mitts are both knitted in the round from the bottom up, starting with a 2 x 2 rib cuff and a ribbed-cable panel that starts in the ribbing and continues along the length of the item, on a stocking stitch base. At the top of the hat, the cable reduces in size, and continues right up into the crown. The mitts have a plain thumb gusset that is worked at the same time as the rest of the mitt, and the thumbs are finished with 2 x 2 ribbing. Each item comes in three sizes, so you should be able to find a size that fits you perfectly. The set is knitted in Yarn Stories Fine Merino DK,* which comes in a variety of solid colours. If you fancied making a really special version of the set, I would suggest using a semi-solid such as The Yarn Collective Bloomsbury DK,* which would emulate the glossy glaze in the pottery. The Scheurich hat and mitts set is available in issue 79 of Knit Now magazine, which is available in shops now, or you can order a copy online.